National Night Out is a yearlong community building campaign that is designed to heighten crime prevention awareness, generate support for participation in local anticrime programs, and strengthen neighborhood spirit and police-community partnerships. 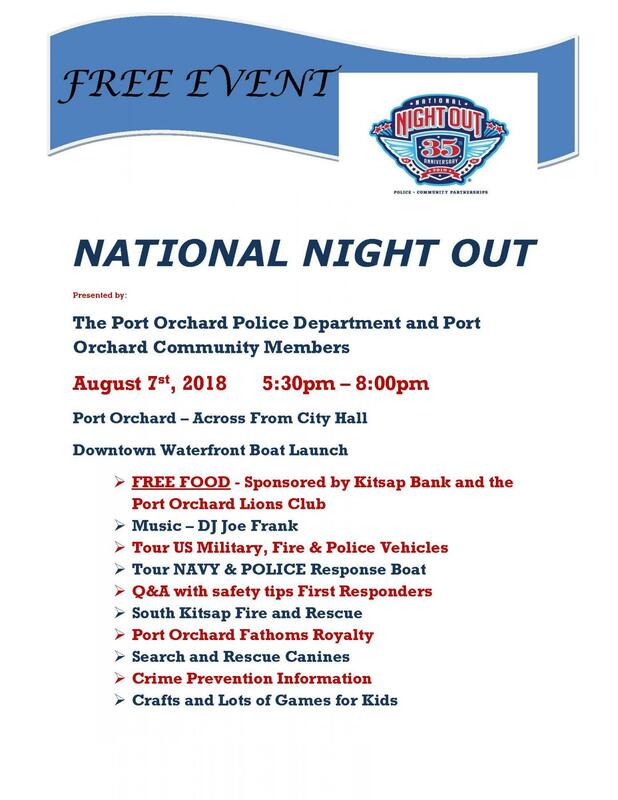 Representatives from the United States Navy, National Guard, and U.S. Coast Guard Auxiliary will be attending, along with South Kitsap Fire and Rescue, Kitsap Search and Rescue, We have various community organizations that will be available to educate citizens on a variety of subjects. When: Between 5:30 - 8:30 p.m.
Where: Water Street Boat Launch Park area, across from Port Orchard City Hall. Please check back for more details on the 2018 event. Click here to check out the Kitsap Daily News article on the event.